Live tweeting. You're doing it ... wrong? Conference season is upon us. Whether you're planning one or attending one or more, chances are Twitter will be involved. Live-tweeting at conferences is growing in popularity; it started organically—attendees tweeted about conferences they were at on their own, without "official" sanctioning. Now, many events publicize a hashtag and encourage live-tweeting throughout. Here's how to be better at it, regardless of what side of the tweet you're on. Have a purpose in mind. Foster a sense of community and network among conference-goers (measure registrants to participants ratio). Collate content so you can summarize the day's (or session's) tweets and photos (Storify is great for this, by the way) in blog posts or eNewsletters, to share with members who couldn't attend. Increase engagement among your target audience (measure tweets, retweets, favourites, conversations, and mentions). Is your audience even on Twitter? One way to determine this is to encourage registrants to follow your Twitter account at registration time, and to ask people for their Twitter handle when they register. This will help you to make decisions around how much pomp and circumstance to give live-tweeting. At last year's CPRS conference, for example, a giant (and I mean colossal, movie-sized) screen displayed tweets, profile pictures, and uploaded photos in a continuously animated way between sessions. It worked great because probably 50% of the several hundred attendees were participating. You don't want to go to that effort if you have 10 people tweeting at each other. Twitter has two very essential concepts crucial to a successful live-tweeted event: hashtags and usernames. Because everyone tweets in isolation, the conference hashtag is used to find and unite these disparate tweets. Have one, and publicize it everywhere. Post it early and often. Also, usernames are essential to acknowledging and tagging Twitter users. The most common use of the live tweet at a conference is to quote or paraphrase the speaker. Much participant paying-attention time is wasted looking up speaker usernames. Provide them to your attendees in the program or on a screen that everyone can see. AWE's Learn from Alberta's Best conference program with both Twitter handles and LinkedIn profiles for all presenters. 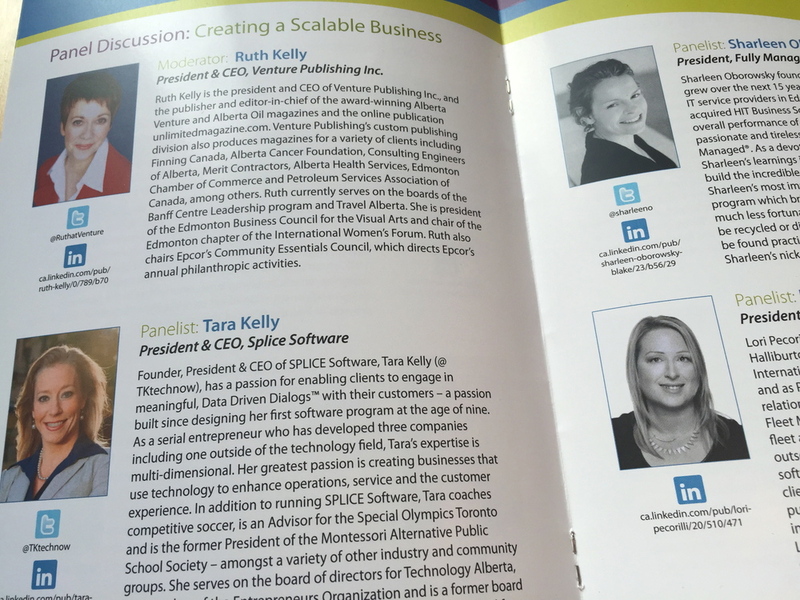 Alberta Women Entrepreneurs did an amazing job of this at its recent conference. Speaker usernames were included with everyone's bio in the program. So was the conference hashtag. Also, don't forget that Twitter requires users to have access to the Internet. Shocking, right? Yet I've been to conferences in concrete bunkers of venues with only 3G coverage on my cellphone, which really curbed my desire to participate. If you want people to tweet, let them do it on your dime: spring for conference wifi. "So excited to be here at #conferencehashtag! Looking forward to a great day!" Who cares? We all know what you're doing, so admit it to yourself. You're announcing to the conference attendees that you're there. You're trying to get noticed, build your network, maybe generate some sales leads. At the very least, there's an element of narcissism in seeing your tweet on the tweet wall. Be a resource, not a burden. If you want to grow your social network, be useful and entertaining to those in it. So, when you're live-tweeting the conference, make sure your contributions do one or the other or both of those things. Chances are, people's heads are in their laps, looking at their smartphones. Help those who missed something by synthesizing a speaker's key points into a tweet. Conference tweets that do this are 300% more likely to get engagement (retweets and favourites). And, when people recognize you're a resource, they're more likely to follow you for more. Caution: "Listening to @speakername talk about [topic]! Awesome! #conferencehashtag" is not a paraphrase. See "It's not about you" above. 2. Capture the gestalt of the conference. Part of the fun of conferences is the fact that you're somewhere that's not the office. You're in a common venue, with like-minded people, and everyone's energy is high. Look for ways to share that with those following the conference hashtag. You poor little date squares! No one at #imedia2014 likes you! Once, I took a picture of the dessert tray after lunch. All that were left were the date squares. So, I posted about how no one seems to like date squares. That Instagram and tweet got more engagement than the important paraphrase-y ones. 3. Connect with another conference-goer. If you see someone else's tweets that you like, engage with them. Retweet, favourite, or respond. Better yet, arrange to meet IRL at the break. No better way to grow your network than to actually network. Hopefully these tips will make your live-tweeting experiences more beneficial and productive. If you have feedback, or your own tips to add, let me know in the comments.